Alcohol: Is it Causing Your Health Problems? Alcohol: While we often hear of the health benefits of moderate amounts of alcoholic, especially wine, it may not be benefitting you. We created this chart after seeing multiple cases where alcoholic drinks was the cause of numerous health complaints that were all related to alcohol consumption. If you find yourself experiencing any of these and you are drinking wine or other alcoholic drinks each night, you may be better off without it. ARTHRITIS. Studies are mixed on the pros and cons of alcohol and relation to arthritis. Changing your diet is very effective with arthritis, and while the studies are mixed, we do not recommend it with arthritis. Wine appears to affect clients with arthritis more than other types of alcohol. SINUS CONGESTION. Sinus congestion from alcohol is caused by high levels of histamine in alcoholic beverages. Beer and wine are higher in histamines than other types of alcohol. ANXIETY, STRESS, COLDS AND FLU. Consuming alcoholic drinks inhibits a person’s reaction to stress by reducing corticotropin-releasing factor (CRF), a key stress hormone. The impairment of CRF leads to the impairment of one’s immune system, which can ultimately result in an increased risk of cancer. It depletes the body of b-vitamins and magnesium (that anti stress vitamins and minerals) vitamin C, K, zinc and potassium. HOT FLASHES. When the body digests alcohol and enters the blood stream, estrogen levels rise. Then when it leaves the blood stream, estrogen levels drop. This extreme drop in estrogen in menopausal women may trigger hot flashes. It also increases blood flow which signals a temperature increase to the brain. The brains responds by releasing chemical messengers to the skin to dilate and dissipate the surplus of heat. This comes in handy when you are trying to stay warm when sleeping outdoors in the mountains, but isn’t ideal in a temperate climate. HEADACHES/MIGRAINES. 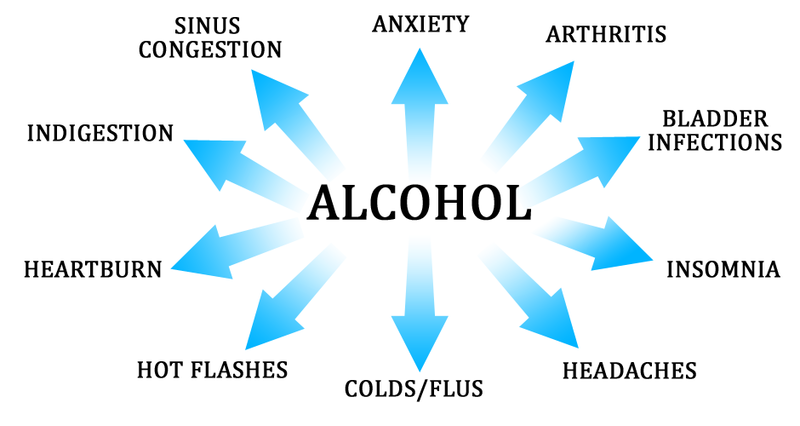 Alcoholic drinks or ethanol dilates the blood vessels in the body and can lead to headaches. Red wine is notorious for triggering migraines or headaches due to the amino acid tyramine. It also acts as a diuretic, causing the loss of minerals and fluid which leads to dehydration. INSOMNIA. Alcohol can disrupt the sleep cycle by initially increasing drowsiness, but causing shallow sleep and multiple awakenings due to the rapid metabolism and change in blood concentrations in the middle of the nights. INDIGESTION/HEARTBURN. Alcohol can increase gastroesophageal reflux, and weaken the lower esophageal sphincter. This effect is one of the causes of heartburn. In low doses it can stimulate gastric acid secretion, but in higher doses it inhibits it which means the stomach has less ability to kill bacteria that enter the body with food and can lead to the colonization of harmful bacteria in the upper small intestine. BLADDER INFECTIONS. Alcohol promotes bladder infections due to the irritation of the urinary tract.